I secretly pride myself in drawing characters that almost no one else on the planet seems to care about or even know. Martha, an evil female cyborg, is the final boss from the Combatribes video game. 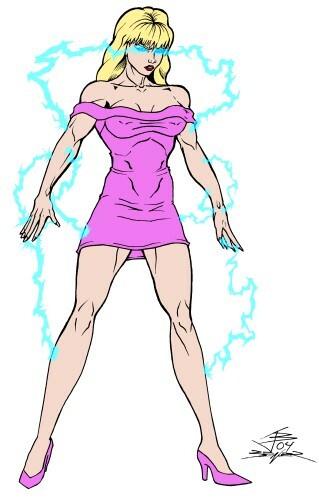 Part of her cybernetic arsenal is to channel some form of electricity though her body while attacking. In the arcade game, she runs away after you win the fight against her, but she isn't so lucky in the home version for the SNES. The really interesting part about the home game is that Nintendo seemed to have some rule where female characters weren't allowed to be in side-scrolling beat-em-up games (like Double Dragon, Final Fight, etc) for the SNES. Martha was one of the earliest characters to buck that trend. About the picture: I'm showing the flat color version first because the lightning was drawn and scanned from a separate piece of paper, the black linework was turned blue and placed on a PSP7 layer on top of the flat color picture. I put a cheap effect on that layer so you could still see through it.